by experienced and qualified craftsmen. The true quality of this type of tatami is visible as it ages. It gains a lustrous color, changing to a lovley golden brown. Kyo-tatami (handmade) is designated as a Kyomono Traditional Craft. Main part of the manufacturing process is done by hand. It has to be manufactured by traditional technique or method. The design and materials have to be traditional. 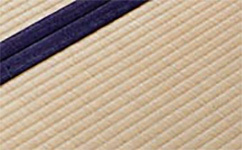 In addition, manufacturers of Kyo-tatami have to be a member of the ‘Kyoto Tatami Association of Commerce and Industry’, and the products have to be done within the designated area in Kyoto-city, Uji-city, Jyoyo-city, Muko-city, Nagaokakyo-city, Kyotanabe-city, and Yosano-cho, – all in Kyoto Prefecture. Kyo-tatami is an iconic symbol of traditional techniques inherited in Kyoto. *1）First Class Certified Tatami Craftsman is a national accreditation recognized by the Ministry of Health, Labor, and Welfare. Tatami has a long history for around 1300 years. It appears ‘Kojiki’ in the Nara period. Tatami production originated in Japan. Originally, tatami was used by aristocrats as a symbol of power. With people of importance sitting on tatami and the common people on the floor or ground. As Chado (the way of tea), developed, Kyo-tatami underwent several changes, and became increasingly used by the general public. Kyoto’s rich history, once being the capital along with its numerous important and historic shrines and temples, mean Kyoto craftsmen have a distinguished technique and ability. Currently, these kinds of tatami are produced: ‘general tatami’ for homes and tea rooms; ‘Yusoku datami (tatami)’ for shrines and temples. ‘Yusoku datami’, including ‘Atsujo’, ‘Haishiki’, are mainly produced in Kyoto due to the level of skill required. 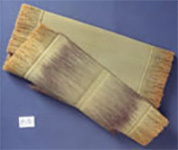 Although tatami has been increasingly produced by machine, traditional technique is still passed down in Kyoto and remains superior to machine made. Wara-doko (natural straw base), hand-sewn by craftsmen is said to last more than one hundred years with the appropriate care.